The scientist does not study nature because it is useful; he studies it because he delights in it, and he delights in it because it is beautiful. If nature were not beautiful, it would not be worth knowing, and if nature were not worth know ing, life would not be worth living.- Henri Poincaré. Congratulations! The Maryland Chaos Group has been ranked #1 (tied with the University of Texas, Austin) in the country by U.S. News! Washington Area Chaos Group photo! The idea that many simple nonlinear deterministic systems can behave in an apparently unpredictable and chaotic manner was first noticed by the great French mathematician Henri Poincaré. Other early pioneering work in the field of chaotic dynamics were found in the mathematical literature by such luminaries as Birkhoff, Cartwright, Littlewood, Levinson, Smale, and Kolmogorov and his students, among others. In spite of this, the importance of chaos was not fully appreciated until the widespread availability of digital computers for numerical simulations and the demonstration of chaos in various physical systems. This realization has broad implications for many fields of science, and it is only within the past decade or so that the field has undergone explosive growth. It is found that the ideas of chaos have been very fruitful in such diverse disciplines as biology, economics, chemistry, engineering, fluid mechanics, physics, just to name a few. 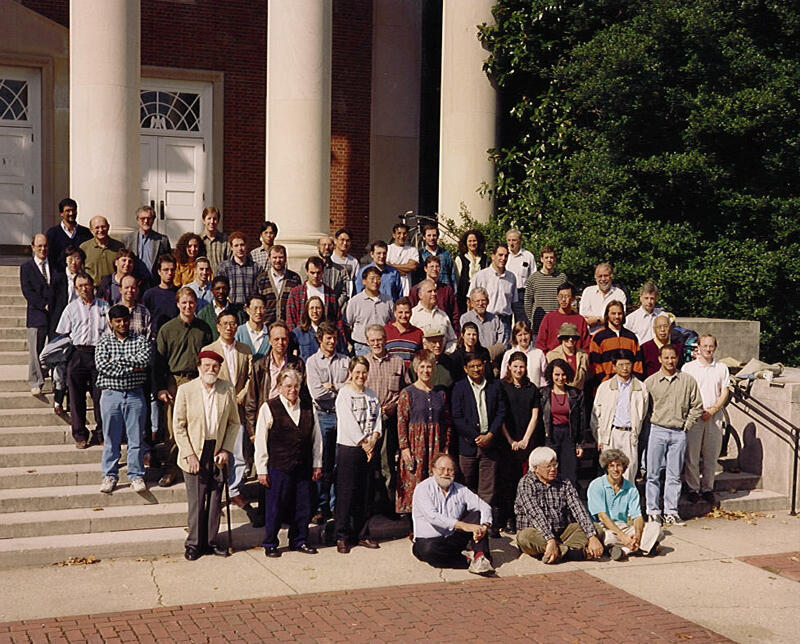 Since the mid-1970s, the Chaos Group at Maryland has done extensive research in various areas of chaotic dynamics ranging from the theory of dimensions, fractal basin boundaries, chaotic scattering, controlling chaos, etc. It is hoped that the knowledge we have gained is of use to others, and it is the objective of this web site to disseminate those fruits of labor. Enjoy!!! General References - Introductory Readings on Chaos. 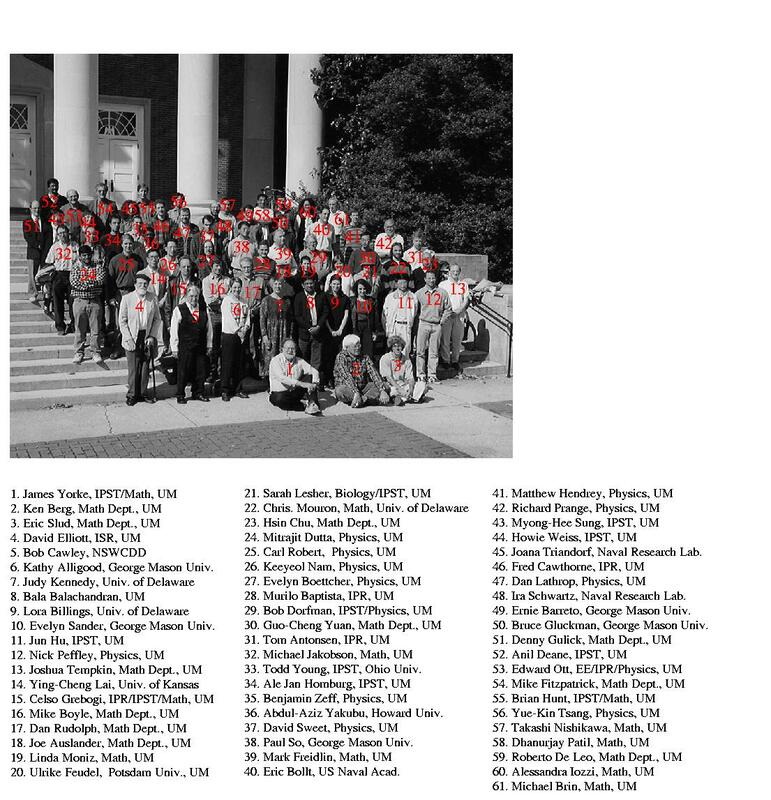 Papers - A listing of some of the group's papers (many with abstracts). Papers On-line - papers in downloadable format for your perusal. Chaos Database - Bibliography of papers related to Nonlinear Dynamics. Ronnie's Chaos Database - Ronnie Mainieri set up a searchable bibliography. Miguel Sanjuan's Compiled List of References - Includes a simple search engine. To make the page more readable, I have moved all the links to the Nonlinear Sites page. Site currently maintained by Ernest Barreto, Takashi Nishikawa and Carl Robert.